I've only completed a few Entrelac projects over the years. I love this technique of constructing an object out of interconnected squares, it isn't as hard as it looks. While I've seen many projects that are lovely, I haven't ever seen any subtle entrelac projects... until now. I received the book Entrelac 2: New Techniques for Interlace Knitting by Rosemary Drysdale as part of my Vogue Knitting Live 2014 admission. This sequel shares new ways to do this technique AND multiple patterns that subtly take advantage of this basketweave. I shouldn't be surprised with the idea of putting other types of stitch patterns inside an entrelac square. I learned in my cable design class how cool it is when you cable lace and ribbing, why wouldn't it be just as cool to do this with entrelac? 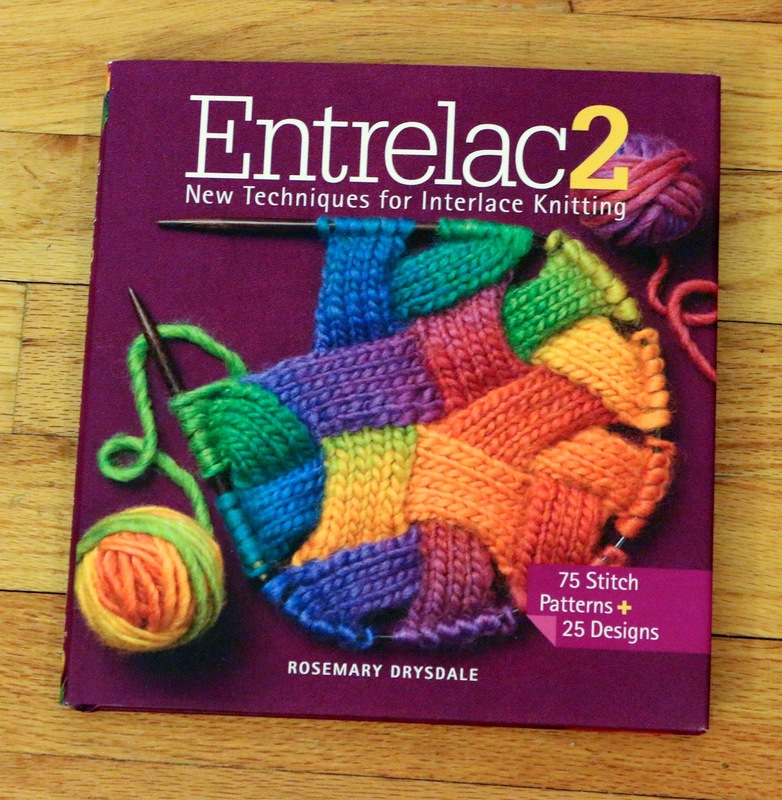 This book starts out with an introduction on how to start knitting entrelac. The stitch patterns are divided into six sections: Basics, Beading, Cables, Lace, Buttonholes, and Triangles. I disagree with the method Drysdale uses to bead (putting all beads on the yarn in advance), but this is really a matter of preference. Otherwise I think her tutorials are pretty helpful. I am much more intrigued by doing entrelac with cables and lace, these provide a whole new level of design to a garment. When I got to the end of Triangles, I expected to move into the patterns but instead I found myself in a "Beyond the Basics" section. Here we are exploring Four Star, Five Star, Six Star, Zig Zag and Braid Coil type configurations of entrelac. Suddenly I am seeing some swatches that really excite me as you go beyond stockinette in these configurations. It is hard to not think of fun tams when you're going through the 6 star configurations. In Chapter 3 we hit the projects. There is a variety of patterns from scarves and hats to sweaters and pillows. I LOVE the Color Block Mohair Tee. This is a really elegant two tone sweater with a subtle entrelac top and then stockinette body. The Pretty Patchwork Tunic has huge entrelac squares all over the main body of the sweater. I've never seen this technique look so refined as it looks in these two garments. The Shades of Gray Pillows have an unfortunate title, but are actually really pretty and modern. I wouldn't mind having some of these on my sofa, and they are a fun way to play around with the techniques. I almost did a double take with the Aran Poncho. This garment has entrelac cables on the front that are set in a way you almost wouldn't notice them as squares, you would think that magic took over the cables for them to run on a bias. Finally, I like how the Slouchy Striped Hat combines colorwork and entrelac - stripes travel through the entire hat that really highlight the entrelac. I'm not sure whether I would have purchased this book if it weren't given to me for free, but now that I have it I'm happy that it is in my library. I'm excited to play more with entrelac and maybe try to incorporate it into some of my own designs. If you get a chance to see this book at your local library I highly recommend you take a peek! Let it Snow... so we can Snow Dye More Fiber! A Beatles Themed Baby Shower!